We’d love your help. Let us know what’s wrong with this preview of The Afterlives by Thomas Pierce. A love story that asks: what happens after we die? The debut novel from National Book Award 5 Under 35 Winner and author of the “ridiculously good” (New York Times) collection Hall of Small Mammals. Jim Byrd died. Technically. For a few minutes. The diagnosis: heart attack at age thirty. Revived with no memory of any tunnels, lights, or angels, Jim wonders what—if anything— A love story that asks: what happens after we die? The debut novel from National Book Award 5 Under 35 Winner and author of the “ridiculously good” (New York Times) collection Hall of Small Mammals. Jim Byrd died. Technically. For a few minutes. The diagnosis: heart attack at age thirty. Revived with no memory of any tunnels, lights, or angels, Jim wonders what—if anything—awaits us on the other side. To ask other readers questions about The Afterlives, please sign up. This answer contains spoilers… (view spoiler)[ I think it's intentionally left open, but, statistically speaking, I'd say either heart attack, cancer or stroke. I interpreted the final scene where…more I think it's intentionally left open, but, statistically speaking, I'd say either heart attack, cancer or stroke. Exit every mood, every memory. Pulled from death’s grasp, Jim Byrd hears the doctor asking for his full name and if he knew, pointing to the television on the wall, what it was for. Momentarily wondering why the doctor doesn’t know these things, a young nurse explains that he’d been discovered at the bottom of the stairs in his building by a man who then proceeded to give him CPR until the paramedics arrived. ”A misfire, my cardiologist called it. Jim Byrd died, was brought back to life, and his heart was now connected to a device that regulated and monitored his heart – HeartNet – an implanted defibrillator, which he can track with his phone, and that will send him alerts when your heart fails to beat on its own. This is the story of Jim Byrd, his life and those in his life, his parents, his wife, and a house with a history. A fire. A death. An interest in connecting with the departed, a woman named Sally Zinker, a professor at UNC, a physicist who is focused on connecting with those who are no longer among the living. There is a love story or two, the “investigation” into traveling to visit those in the ‘Afterlife,’ but that is almost just a device to connect us to the idea of life after life. The connection of the here and now to the always present, forever view of mankind and the heavens, but not in a religious sense, or even so much a “ghostly” presence. More in the eternal nature of things, but in an almost playful sense: life after life. I don’t know what I expected from this, except I was skeptically hopeful. I’d wanted to read this since I own a copy of it, a gift, and I felt somewhat obligated to read it. It was a bit of a surprise, although I can’t say that I gushingly loved this, I was surprised how much I enjoyed it overall. Jim Byrd had experienced death. Had, in a sense, been plagued by the idea that he didn’t recall experiencing any angels, harps, gates…any… anything. As he grows older, as the world changes, as technology takes larger leaps into our lives he is haunted by the thought: What if this is all there is? Why didn’t he see anything? Or, perhaps… does he just not remember what he saw? When his father dies, he keeps waiting for some sign, some way to find out more. To talk with his father once more, to know what is …there. There’s a bit of everything in this, at least that’s how it felt at times, love stories and mysteries with everyday life as well. Occasionally there’s a lovely, if fleeting, glimpse at some of these everyday moments, which I enjoyed. Part ghost story, part love story, part philosophical/scientific time-travel mishmash, Thomas Pierce's The Afterlives has a little something for everyone. If you like reading plot books that highlight relationships, or wonder a lot about theories of death and existence and "daisy holes" (as they're called here) separating present from past from future, eureka! You've found your book! For me, a fun pleasure read, which I don't often treat myself to. 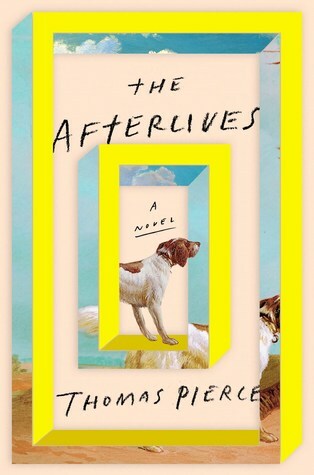 I like my books a bit chewier, as a rule, but so Part ghost story, part love story, part philosophical/scientific time-travel mishmash, Thomas Pierce's The Afterlives has a little something for everyone. If you like reading plot books that highlight relationships, or wonder a lot about theories of death and existence and "daisy holes" (as they're called here) separating present from past from future, eureka! You've found your book! For me, a fun pleasure read, which I don't often treat myself to. I like my books a bit chewier, as a rule, but sometimes your jaw gets sore and you need a smoothie (hopefully made with power greens). I think it was a bit fat at 363 pp., but I'm always in favor of scissors (except when it comes to my own writing, ha ha). "She slept peacefully, her warm rump turned toward me, the blanket halfway up her leg, a burn mark on the sheet from the dryer. Everything felt significant, fleeting. “I wanted to appreciate every aspect of this moment, to preserve it, to live in it forever. Annie’s light wheezing breath, the dance of the curtain across the AC vent on the floor, the clock’s red flashing colon that held the hours from collapsing into the minutes. I was in agony. I was crying. Sobbing, actually, face pressed to the pillow, the heat of my face rebounding off the fabric." See? Pierce seems to be saying. I can do description, too. But mostly it was storyline and train stops for plots and subplots. Get on, get off. Flip pages. What happens next? Who dies? Does anyone die? And how do we communicate with the dead? And do we want to communicate with the dead? This is a peculiar book, and I liked it but I'm not quite sure what to make of it. From the start I found the narrator offputting, but whenever I thought I might as well give up, something hooked me and pulled me back in – a story about a ghost on a staircase that's titled 'The Tale of the Dog on Fire'; an organisation called 'the Church of Search' which has holograms giving inspirational talks; historical chapters that move back and forth through a character's life as though time is not linear This is a peculiar book, and I liked it but I'm not quite sure what to make of it. From the start I found the narrator offputting, but whenever I thought I might as well give up, something hooked me and pulled me back in – a story about a ghost on a staircase that's titled 'The Tale of the Dog on Fire'; an organisation called 'the Church of Search' which has holograms giving inspirational talks; historical chapters that move back and forth through a character's life as though time is not linear but a picture book to be flipped through. The occasional historical chapters tell the story of the building's former residents/possible phantoms, Clara and Robert Lennox, and their families. Surprisingly, these are among the best parts of the book. Pierce uses a brilliantly effective structure here, moving swiftly and non-chronologically through the characters' histories but making us aware, via the subjects' apparent awareness of their timeline-jumping, that these are perhaps more than memories (a nod to the book's title). He also teases out unexpected connections between the historical and contemporary characters in so subtle a style that I didn't see them coming – yet they made perfect sense. This is a novel of the fantastic – from ghostly presences to futuristic tech – yet it's grounded in the banal, creating an oddly folksy strain of science fiction. Critics' reviews of The Afterlives tend to make it sound like it has a solid plot, suggesting Jim goes on some kind of quest for hope or meaning, but when you're reading it, it feels more like a meandering meditation on mortality (alliteration unintentional, but quite fitting). I received an advance review copy of The Afterlives from the publisher through Edelweiss. Following a near-death experience during which he technically died for several minutes, 33-year-old Jim Byrd becomes hyper-aware of his own mortality. Death seems to be everywhere. There's a ghost haunting a restaurant owned by one of his clients. He even lives in a retirement town where "old people come to die." Consumed by his uncertainty about what happens in the afterlife (and convinced from his own experience that the answer is nothing) Jim and his wife Annie search for proof. They learn abo Following a near-death experience during which he technically died for several minutes, 33-year-old Jim Byrd becomes hyper-aware of his own mortality. Death seems to be everywhere. There's a ghost haunting a restaurant owned by one of his clients. He even lives in a retirement town where "old people come to die." Consumed by his uncertainty about what happens in the afterlife (and convinced from his own experience that the answer is nothing) Jim and his wife Annie search for proof. They learn about an elusive physicist named Sally Zinker who believes that human beings only 93% exist in this world and has supposedly created a machine that allows the living to connect with the dead. But will they find the answers they so desperately want, or merely end up more uncertain than ever? The Afterlives is a smart, funny and imaginative work of speculative fiction written for those of us who battle the existential dread of knowing that one day we and everyone we love will die—those of us who don't have the comfort of a firm belief in any sort of afterlife. Thomas Pierce approaches the interplay of technology and immortality with considerable subtlety in his debut novel, "The Afterlives." The story opens as 33-year-old Jim Byrd is revived from sudden cardiac arrest. He is happy to be back but dismayed that during the minutes he was technically dead he “saw nothing. No light, no tunnels, no angels.” That would seem to snuff out prospects for the great beyond. Yet Jim, a loan officer, ends up approving the mortgage for an old building that may be hau Thomas Pierce approaches the interplay of technology and immortality with considerable subtlety in his debut novel, "The Afterlives." The story opens as 33-year-old Jim Byrd is revived from sudden cardiac arrest. He is happy to be back but dismayed that during the minutes he was technically dead he “saw nothing. No light, no tunnels, no angels.” That would seem to snuff out prospects for the great beyond. Yet Jim, a loan officer, ends up approving the mortgage for an old building that may be haunted. Pierce, one of the National Book Foundation’s recent 5 Under 35 Award winners, wanders wherever the spirit moves him, which may frustrate readers looking for drama, but I was enchanted by his thoughtful ruminations and wry comments about church and spirituality. Intercalary chapters about the haunted house’s original residents vibrate with ectoplastic energy. Pierce is particularly unsettling when he describes. . . .
Jim's new life begins when he almost dies, a life in which he finds love, hears a ghost, meets a psychic, and tries to find out what happens after we die. His journey leads him through life, death, and in between, but for Jim, the questions keep coming. What does it mean to lose? Or to move on after loss? Pierce has written a brilliantly imaginative and beautiful novel about the big, impossible questions, fear of the unknown, and the people who keep us from spiraling into the darkness. The Afterlives has a quirky, off-beat premise that caught my attention when I read the synopsis. Unfortunately, the premise was the most interesting thing about it. After a near death experience, thirty-three year old Jim Byrd embarks on a quest to find the meaning of life. Is there an afterlife? Do we live on after death? Does it matter? These deep, existential questions fall flat when we meet Jim Byrd, a boring, dull, bland white male who lacks wit, talent or any discerni The Afterlives has a quirky, off-beat premise that caught my attention when I read the synopsis. Unfortunately, the premise was the most interesting thing about it. These deep, existential questions fall flat when we meet Jim Byrd, a boring, dull, bland white male who lacks wit, talent or any discernible quality that makes him interesting. He pretty much coasts through life working a meaningless job and meets an old girlfriend at a restaurant. Eventually, they marry. Interspersed with Jim's recounts of his daily routine are vignettes of a couple from over fifty years ago that experienced a traumatic event in a home that was later converted into the restaurant Jim will later visit in the future as part of his duties as a loan officer at a bank. This couple's unhappy marriage has permeated the core and structure of this building and infused it with a supernatural quality that continues to affect residents or anyone who comes in contact with this building. When I picked The Afterlives up from the library, I noticed it was categorized as romance but that doesn't feel right. Just because Jim pontificates about his wife and marriage and their quest on searching for the existence of an afterlife does not make this a love story. In my opinion, this story is more about the subject of love; the love that comes from the connections we make with our family, our friends, our colleagues, people we respect and admire, not the romanticized and/or sexual love we feel for a partner. The problem with this book is that it meanders. I'm not sure what its trying to say. The writing is good but wasted here on various story threads that lack cohesiveness. If the author had focused on the supernatural quality of the building and what it may mean for the existence of an afterlife, the story would have been more grounded. Instead, we get side stories about this unhappy couple alongside Jim's unimaginative outlook on life despite his near death experience. As their marriage progresses, science and technology develop at a rapid pace, so much so that it is difficult to differentiate between reality and surreality. When Jim and his wife meet a female scientist who has devoted her life and career to proving the existence of an afterlife, they are both confronted with personal issues from the past; Jim and the loss of his father, his wife's loss of her first husband, and what it means to go on after we lose the ones we love and care about. This book had such a fascinating idea but it was bogged down with a weak main character and too many tangents about minor characters I did not care for nor could I understand why we were given these small histories about them in the first place. Seeking answers to the meaning of life and why we are here in this world is a fundamental part of living, of growing, of evolving and of the way we process our own mortality. But as I read on, it felt like the author was unsure of where to go with his story. Is it about marriage? Family? Death? Or is it about none of this? People die, we die and life goes on? The lack of a strong narrative focus created confusion on how I should approach the book as I read it. I was hoping this book was about ghosts and the supernatural but it ended up as a boring recap of characters I neither liked nor identified with interspersed with brief reflections about life, living and marriage. I really enjoyed Mr. Pierce's writing. Rating: All of the stars!!!!! Recommended for: Everyone who wonders what's next or enjoys the big questions or loves to see the gorgeous in the plain mundane everydayness of life or those who like their sci-fi light and sprinkled with a very contemporary feel. Pierce is not afraid to confront the big questions about life, death and the thereafter in THE AFTERLIVES. His exploration of mortality and technology was particularly interesting (holograms are terrifying). How do we live when we know we will die, everyone we love will die, everyone who loves us will die? How? It’s unbearable and yet we face it each and every day. This book is definitely for those of us who spend a lot of time thinking these thoughts. I loved it. I fell victim to strong marketing. The main character is dull, the story is boring, and the dialogue is adjective heavy. Reads like a YA novel. Case in point in why I plan to be much more leery about new releases moving forward. I wish this book had been a little less Straight White Dude in its perspective. The writing is great, especially in how genuinely it earns its emotional payoffs, but at the end of the day what I couldn't shake off was the disappointment in how obvious and boring the narrator's problems were. He's another white dude concerned with mortality but only in a philosophical sense, which speaks to his relative safety and comfort living in the world. I'm not calling for the book to be written from a marg I wish this book had been a little less Straight White Dude in its perspective. The writing is great, especially in how genuinely it earns its emotional payoffs, but at the end of the day what I couldn't shake off was the disappointment in how obvious and boring the narrator's problems were. He's another white dude concerned with mortality but only in a philosophical sense, which speaks to his relative safety and comfort living in the world. I'm not calling for the book to be written from a marginalized perspective, to be a blistering account of sexism or racism, because I know not every book can tackle every problem in the world, but I don't think it's too much to ask for a little more consideration re: intersectionality in fiction. For me, the text lacked a propulsive energy because the issues at hand felt so mundane, though it does certainly ratchet up the intrigue in the last fourth. I wish that drive had been consistent. I was offered an eARC of this book in exchange for an honest review through Edelweiss. I finished this the other day and I have mixed feelings about it. The premise was good. I was super interested in this book the first 3 parts of the book and then I found myself falling asleep while reading. Not highlighting or tabbing anymore. I became a bit bored in the last 2 parts. This story follows a man named Jim who dies for a bit after having a heart attack. Once surviving he was mad because he didn’t see like a light or angels while he was out. He has to have like a “pacemaker” type th I finished this the other day and I have mixed feelings about it. The premise was good. I was super interested in this book the first 3 parts of the book and then I found myself falling asleep while reading. Not highlighting or tabbing anymore. I became a bit bored in the last 2 parts. This story follows a man named Jim who dies for a bit after having a heart attack. Once surviving he was mad because he didn’t see like a light or angels while he was out. He has to have like a “pacemaker” type thing that tracks his heart beat called HeartNet and he also uses a app. Throughout the story Jim and his wife Annie tries to understand the mystery of this ghost story. A old house turned restaurant has a stairwell where weird things were happening to people. And they believed the house/restaurant was haunted. I enjoyed the writing of this book & there was a bit of humor throughout but the talk about Afterlives and angel,God and all that sort of dragged on for a bit in some parts (even though I know that’s the point of the book) the mc is questioning all that and what happens once we die. This is my first read by this author. I found this book in a thrift store for $1. I didn’t know it was a arc until I got home so that’s cool. I really wanted to like this book. I read the synopsis and was so excited when I finally got my hands on it! However, this book ended up putting me to sleep. I couldn't get into it at all. I enjoyed the main character's thoughts but unfortunately none of it was memorable. It also doesn't help that the book is divided five parts with no chapters within each section to help you digest the story easier. A tender and often comical telling of one man's quest to discover the existence and depths of the afterlife — a journey that takes Jim Byrd to New Age churches, into an investigation of a haunted staircase, and in pursuit of a physicist who may or may not have constructed a machine with the ability to bring us in contact with the deceased. Thomas Pierce's first novel is layered with heart, humor and tremendous revelations concerning our technology-ridden lives. This novel defies description. It's a ghost story. It's futuristic. It's a love story. It's science fiction. It’s a mix of all of that and somehow comes together into a cohesive story that I really enjoyed. ✓For readers who love anything paranormal, spiritual, psychic, vibrations, alternate dimensions, etc. I guess that covers it all! --Protagonist; he's so off-putting to the point I don't give a crap if he dies a horrific, gruesome death, trapped in another dimension. 3.5 stars. I like what Pierce is doing here--exploring how technology has changed the way we think about death, or at least the way we think about what happens after we die. I like the fact that the main character is an average-Joe-type person, and I like the setting (maybe only because that part of the world is familiar to me). But after a big warm up, I grew increasingly disappointed with this story. Maybe it's the hologram twist and the way it lends a vague sci-fi tone that really turned me o 3.5 stars. I like what Pierce is doing here--exploring how technology has changed the way we think about death, or at least the way we think about what happens after we die. I like the fact that the main character is an average-Joe-type person, and I like the setting (maybe only because that part of the world is familiar to me). But after a big warm up, I grew increasingly disappointed with this story. Maybe it's the hologram twist and the way it lends a vague sci-fi tone that really turned me off. Every time the "grammers" show up I'm sort of, ewww, just stop. But points to Pierce for making this futuristic aspect of the novel feel pretty commonplace. This book almost defies description and I'm still basically 'speechless' upon finishing. Yes, I can say it's a fictional novel (unless author Pierce knows things we don't! ), but then I can tell you all the different genres and subjects it touches: fantasy, the supernatural/ghosts, sci-fi and aliens, relationships, religion and the question of God, conspiracy theories, and the biggest question of all - what happens to us all when we die. The novel begins when Jim Byrd dies for a few minutes, but h This book almost defies description and I'm still basically 'speechless' upon finishing. Yes, I can say it's a fictional novel (unless author Pierce knows things we don't! ), but then I can tell you all the different genres and subjects it touches: fantasy, the supernatural/ghosts, sci-fi and aliens, relationships, religion and the question of God, conspiracy theories, and the biggest question of all - what happens to us all when we die. The novel begins when Jim Byrd dies for a few minutes, but he is left with no experience of seeing an 'afterlife', ie, no 'tunnels with lights'. This leaves him with huge life questions and starts seeing the world in a whole new way, along with his new 'HeartNet' to keep his ticker beating safely. The world in which this novel is set in, is even filled with holograms, and so many questions for Jim, and consequently for the reader. I didn't read this as quickly as some books because of that, and I was often putting it down to digest and think about what I'd just read because of everything I just had to absorb. There's actually a lot of humor in the novel too, so even though there are huge topics on the table like life and death, the tone of the book remains light, even when big events happen. Originally I was put off by the fact that Jim's romance and subsequent relationship with his wife Annie, would be central to the novel, but it ended up being such an original journey that they were on, that I was absorbed by their story within the bigger story. This booked echoed many thoughts I've had in my life. I absolutely loved The Afterlives, I didn't want the story to end. It was poetic, insightful, funny, generous, and a little futuristic. Full of faith and doubt and complex characters. It left me reminiscing about vignettes in my life for days on end. I was pretty convinced this was a 3 book, which for me still means quite good, but the last 1/4 really upped it and I’m left feeling adrift. I want to reread the ending, and I want to discuss with someone, wah! Wow. Mir fehlen die Worte! Anhand der kurzen Leseprobe von Thomas Pierce‘ Romandebüt „Die Leben danach“ konnte ich mir nur schwer ausmalen, wie sich dieses Buch entwickeln würde – ist es ein Roman über einen Mann, der sein Leben völlig umkrempelt, eine Liebesgeschichte oder etwas völlig anderes? Wie sich herausgestellt hat, trifft der letzte Punkt den Nagel auf den Kopf. Es beginnt damit, dass unser Protagonist Jim, ein ziemlich durchschnittlicher Typ, einen Herzstillstand Wow. Mir fehlen die Worte! Anhand der kurzen Leseprobe von Thomas Pierce‘ Romandebüt „Die Leben danach“ konnte ich mir nur schwer ausmalen, wie sich dieses Buch entwickeln würde – ist es ein Roman über einen Mann, der sein Leben völlig umkrempelt, eine Liebesgeschichte oder etwas völlig anderes? Wie sich herausgestellt hat, trifft der letzte Punkt den Nagel auf den Kopf. Es beginnt damit, dass unser Protagonist Jim, ein ziemlich durchschnittlicher Typ, einen Herzstillstand hat und für eine Minute oder zwei tot ist. Dadurch, dass er in diesen wenigen Momenten keinerlei Nahtoderfahrung, gleißendes Licht oder ähnliches gesehen hat, ist er nachhaltig verstört. Zum Schutz vor weiteren Herzproblemen wird ihm ein technologisch sehr fortgeschrittenes „Sicherheitsnetz“ um sein Herz herum implantiert, das sein Herz auch dann weiterschlagen lassen würde, wenn er bereits tot ist. Dass er das Gerät und seinen eigenen Herzschlag über sein Handy in Echtzeit verfolgen kann, macht die Möglichkeit des Todes zu seinem ständigen Begleiter. Fortan sieht er das Leben mit neuen Augen und ist sich permanent seiner eigenen Sterblichkeit bewusst. Jim beschäftigt sich obsessiv mit den Nahtoderfahrungen anderer Menschen, er liest alles, was er zum Thema findet; er grübelt sehr viel über den Tod, besonders über das, was danach kommt, und kämpft mit Panikattacken, da er Angst vor dem großen schwarzen Nichts hat. "Ich würde sterben. Jeden Moment würde ich sterben. […] Ich würde weg sein. Wie mein Vater, wie alle anderen. Was auch immer es war, ich würde nicht einmal wissen, dass es passiert war. Ich würde mein Leben nicht vermissen. Alles, was ich je gewesen war, würde einfach verschwinden. […] Denn es gab keine andere Seite, oder? Das hier war die einzige Seite, nicht wahr?" Dann kommt er zufällig mit einem kuriosen Fall von Spuk in Berührung: In einem Restaurant wurde auf einer Wendeltreppe eine Stimme aufgezeichnet, die eindeutig nicht von dieser (lebendigen) Welt stammt. Sie ruft: „Der Hund brennt!“ Auf dieser Wendeltreppe soll allerdings nicht nur diese Stimme zu hören sein, die Restaurantbesitzerin berichtet auch von geisterhaften Erscheinungen und dem Gefühl von dem Druck von Händen, die Menschen von der Treppe zu stoßen scheinen. Jim ist zugleich fasziniert wie verstört. Noch während er darüber brütet, welche logische Erklärung es für diesen vermeintlichen Spuk geben kann, trifft er seine Ex-Freundin aus Schulzeiten wieder und verliebt sich glatt erneut. Nun jongliert Jim zwischen seiner Angst vor dem Tod, einer frisch entflammten Liebe und dem Rätsel der Wendeltreppe. Sein Leben beginnt, sich drastisch zu verändern. Der Spuk sowie die vorherigen Bewohner des Restaurants, die vermutlich Ursprung dieser Geistererscheinungen sind, beschäftigen Jim viele Jahre lang. Er erforscht die Familiengeschichte, beschäftigt sich mit paranormalen Forschungen und esoterischen Riten, mit denen man mit den Toten kommunizieren können soll. Dabei stößt er auf die Physikerin Sally Zinker, deren Forschung sein Leben komplett auf den Kopf stellen wird. Was Jim eigentlich nur als übersinnlichen, mystischen Mumpitz abtut, nimmt reale Formen an und gewinnt durch die Forschung der Physikerin enorm an Glaubwürdigkeit. Sally Zinkers Forschung beschäftigt sich mit Geistererscheinungen und den sogenannten Daisy-Teilchen, die die „andere Seite“, die Totenwelt in einer bestimmten Situation durchlässig erscheinen lassen. Auf diese Weise kann innerhalb eines kurzen Zeitraums sozusagen Kontakt mit den Verstorbenen aufgenommen werden. Damit man diesen Kontakt allerdings steuern kann, um gezielt mit geliebten Menschen zu kommunizieren, muss man für den Bruchteil einer Sekunde aufhören zu existieren. Das klingt verrückt? Ja, etwas, aber Thomas Pierce schafft es, Gedankengänge, die wir alle wohl an dem einen oder anderen Punkt unseres Lebens einmal tätigen, mit physikalischen Prinzipien und Forschungen zu verknüpfen und sogar noch eine Liebesgeschichte, die nicht kitschig ist (juhu!) einzubauen. Ein echtes Allround-Paket also, das nicht nur die Grenzen des Klappentextes sprengt, sondern auch alle Erwartungen. Lange habe ich keinen so guten Roman mehr verschlungen. „Die Leben danach“ erinnert mit seiner zugleich wissenschaftlichen als auch philosophischen Note stark an die Werke von Scarlett Thomas, die in ihren Roman verschiedenste Themengebiete spannend verwebt. "Sie suchte nicht unbedingt nach Gott. Sie suchte nach einem Anzeichen dafür, dass das Leben über den physischen Körper hinausging, dass das Bewusstsein auf irgendeine Art den Tod des Körpers überleben konnte." Thomas Pierce hat mit „Die Leben danach“ ein Meisterwerk geschaffen, das auf so vielen Ebenen einfach nur genial ist. Selbst die Zinkers Forschung ist wahnsinnig gut beschrieben, man wird nicht mit harten physikalischen Fakten bombardiert, sondern erfährt alles über die Daisy-Teilchen wohldosiert und niemals trocken. Sehr gut gefallen hat mir zudem auch die Zukunft, die der Autor uns schildert: Jim lebt nicht weit, jedoch einige Jahre in unserer Zukunft. Hologramme werden immer alltäglicher und bilden einen netten roten Faden, der die Frage „Was ist real?“ immer wieder aufnimmt und alles Fleischliche, die Hologramme sowie die Erscheinungen aus der Welt der Toten verknüpft. Weiterhin finden sich am Ende jedes Kapitels Szenen der früheren Bewohner des „spukenden“ Hauses, und nach und nach kommt man dem Geheimnis auf die Spur und beginnt, zu begreifen. Wenn die Puzzleteile ineinandergreifen und alles plötzlich Sinn ergibt, bildet Pierce‘ Roman ein großartiges Gesamtbild. Denn der Autor schafft es zum Ende hin tatsächlich, alle losen Fäden, die er im Laufe seines Romans aufgreift, zu verknüpfen. Auch wenn der Kopf nach der Lektüre vor lauter Fragen zum Thema „Leben“ nach dem Tod zu platzen droht, verbleibt das Gefühl der Begeisterung: für die Story, die Idee – und das Talent des Autors, der mit seinem ersten Roman direkt einen Volltreffer landet. Bitte mehr davon! First off, I think the cover is stupid. There is a thing about the dog in the book, but like the book, it doesn't really convey the message of the story. Jim Byrd dies for a few minutes and remembers absolutely nothing, no white lights, no dead family members visiting, nothing but blank/blackness. He is given a heartnet which keeps his heart beating and is a replacement to a pacemaker, but with a battery life of 200 years. Thus, conceivably his heart could continue to beat even after he is dead. First off, I think the cover is stupid. There is a thing about the dog in the book, but like the book, it doesn't really convey the message of the story. Jim Byrd dies for a few minutes and remembers absolutely nothing, no white lights, no dead family members visiting, nothing but blank/blackness. He is given a heartnet which keeps his heart beating and is a replacement to a pacemaker, but with a battery life of 200 years. Thus, conceivably his heart could continue to beat even after he is dead. Quirky, right? Jim is an average guy, except for this heart anomaly. He approves bank loans. He comes across an unusual charge in a loan application that peaks his interest. He visits the restaurant in question, meets the owner, runs into a former girlfriend, hears about a weird experience and it sends him on a research hunt for the former owners. Ultimately, I feel like this book fails it's grand undertaking. To quote from Bill and Ted's Excellent Adventure--time is like a burrito. The story hops around between the past and the present and the authors point is that our lives are still taking place and each moment is being relived again and again and that if we can reduce or subvert our consciousness we should be able to relive those experiences with those people just like the first time. It's tough not to think of Don Delillo's masterwork White Noise here. Both books expound on humanity's fear of death and on our mundane technological and consumerist distractions designed to mitigate this fear. And both are very funny despite their weighty subject matter. What's different is, of course, the 30 years that have elapsed between the two works. While Delillo's book was informed by 1980s Cold War dread and the fear of nuclear annihilation, Pierce's is framed by the emergence of artifi It's tough not to think of Don Delillo's masterwork White Noise here. Both books expound on humanity's fear of death and on our mundane technological and consumerist distractions designed to mitigate this fear. And both are very funny despite their weighty subject matter. What's different is, of course, the 30 years that have elapsed between the two works. While Delillo's book was informed by 1980s Cold War dread and the fear of nuclear annihilation, Pierce's is framed by the emergence of artificial intelligence and augmented reality. In both cases, the books' philosophical concerns and social critiques are spot-on. I really enjoyed this book. it has elements of paranormal and science fiction but doesn't feel like a paranormal or science fiction novel. Mostly it reads like a regular story which occasional odd things happening. I found it to be an easy and quick read. I really liked the flow of the book and the characters (who all seem just slightly weird enough to be pretty normal). I mostly loved the book's idea of what the afterlife is like. Having lost some important people in my life, I think about what I really enjoyed this book. it has elements of paranormal and science fiction but doesn't feel like a paranormal or science fiction novel. Mostly it reads like a regular story which occasional odd things happening. I mostly loved the book's idea of what the afterlife is like. Having lost some important people in my life, I think about what's after quite a bit, but being scientific, I have trouble with a lot of explanations that are given. This book' presentation of the afterlife is really close to what I've thought makes the most sense and there's some comfort in that. great read, i have been waiting a long time to come across a book like this, that has captived me, and made me get pulled into their world and felt what the characters felt. The year 2018 is turning out to be the year of DNF. This may be due to my trying new authors, getting outside my comfort zone. The current book was just not drawing me in, and 200 pages in, I'm out. I figured out what's been bugging me: the book reads like nonfiction. You know, the kind of nonfiction written in first person, like an episode of "This American Life," except in this case the first person is boring as hell. If I'm going to listen to you talk about yourself for 300 pages, you'd bette The year 2018 is turning out to be the year of DNF. This may be due to my trying new authors, getting outside my comfort zone. The current book was just not drawing me in, and 200 pages in, I'm out. I figured out what's been bugging me: the book reads like nonfiction. You know, the kind of nonfiction written in first person, like an episode of "This American Life," except in this case the first person is boring as hell. If I'm going to listen to you talk about yourself for 300 pages, you'd better be an interesting talker. And you'd better have a good story to tell. Scenes are described, not shown. We don't get to experience the story; we're told what happened. Dialogue is rarely used. Secondary characters have jobs at Bank America and CNN. People drive Sentras. Does this add to the realism, the sense that this really happened? No. It's just stuff. Boring stuff. What is next for us after death? The Afterlives' Jim Byrd, struggles with this question after suffering a heart attack, and dying at the age of 33. Given a second chance by advances in technology and medicine, Byrd sets out to find answers, all while living a more meaningful life. In The Afterlives, Thomas Pierce creates a world filled with ghosts, holograms, and old folks. A world abandoning the older generations, and flirting with the future. These changes are monumental, for better or worse. W What is next for us after death? The Afterlives' Jim Byrd, struggles with this question after suffering a heart attack, and dying at the age of 33. Given a second chance by advances in technology and medicine, Byrd sets out to find answers, all while living a more meaningful life. In The Afterlives, Thomas Pierce creates a world filled with ghosts, holograms, and old folks. A world abandoning the older generations, and flirting with the future. These changes are monumental, for better or worse. With life saving heart monitors, and holograms, Pierce is not afraid to dabble in science fiction. He's also not afraid to dabble in the consequences of such technology. The heart monitor hack stories were fascinating, and could easily spin-off into another novel.